Eroni Tawayaga (left) of Fiji Sports Council,Jay White of Bayleys Coral Coast Sevens and Eliki Kaisuva,General Secretary Ukuinakau Rugby during a press conference in Suva yesterday. Fourteen teams have confirmed their spots so far for the 2015 Uluinakau 7s tournament which will be held at Ra Sports Ground on August 14-15. The teams include favorites Tabadamu,Daveta,Samurai(Waimanu Naitasiri), Uluinakau Babas, Namarai Selection, Kavula,Naiyalayala,Nawaqavesi,Naisisili Babas,Nalotu Evening Star,Service ,Dama,Nauria and Senibiau. Uluinakau Rugby secretary Eliki Kaisuva said this year’s tournament was special to them since they would be hosting it for the first time on their home ground. “We’re looking forward to the great two days tournament,” Kaisuva said. 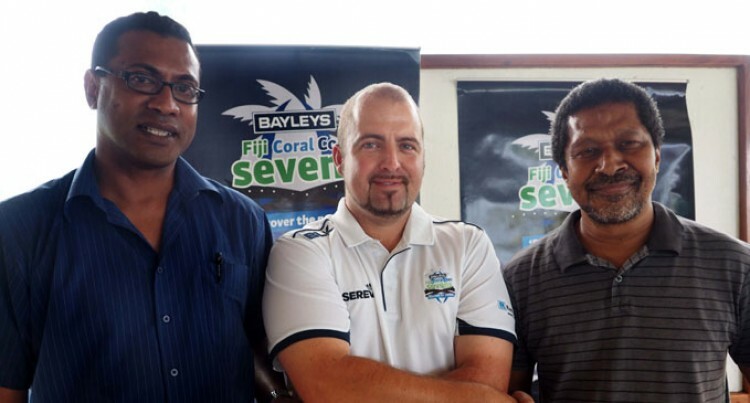 The winner from the tournament will qualify automatically to the Bayleys Coral Coast 7s tournament in January next year. Bayleys Coral Coast 7s tournament founding chairman Jay Whyte said they were proud to join partnership with Uluinakau 7s. “We are proud to partner with Uluinakau 7s as this tournament will serve as qualifiers for the Bayleys Coral Coast 7s tournament. “This will benefit people from the Ra province as they will enjoy exciting two days actions,” Whyte said. The winner will get $3000.